Nestled between the Orcia and Ombrone rivers on the southern slopes of Montalcino, Tuscany, the Castello Banfi vineyard estate is unique for its wine culture and tradition. The wines of Banfi Toscana range, produced with grapes selected from specific Banfi vineyards as well as other noble areas of the region, express the genuine and authentic character of Tuscany. They reflect the love for Tuscany, revealing joy and genuine nature in their easy-drinking style thanks to an inherent liveliness and freshness, these wines are appropriate for everyday consumption, yet always reflect the Banfi standard of character and quality. 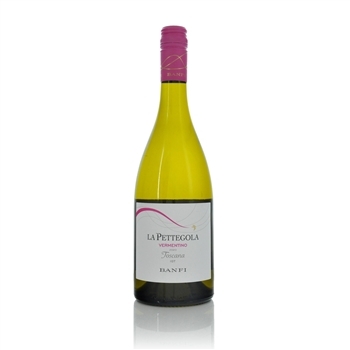 La Pettegola, the new Banfi’s Vermentino, is crafted selecting the best grapes from the Tuscan coast. It is a wine pleasantly intense, sweet, fresh and light that recalls the perfumes of the Mediterranean scrub and expresses the winning combination of tradition and innovation that, since ever, moves the Banfi experience in the world of Tuscan wine..